My father and I went to the early morning flea markets right up until I left my home town in my early 20s. I searched for history. We had something we called our history, we had our odd traditions, we had our generations of cousins far far away and all of the family stories, we had this rather large rambling family home, we shared this penchant for going to the flea market together, searching. It was always about finding something valuable. You know, things possibly worth money. Digging, scanning every table, every little case, searching. "Come and see what I've found." There were a few things that gave something value. One, being a collectible or well crafted. The other, the thing being old. Really old meant really valuable in my mind. Like this object had tendrils that extended and intertwined with something completely inaccessible to us now. Holding secrets in the present tense, while having mingled with emotions and harbored the collective thoughts and sighs that changed and swerved and as a whole became self aware. Things that spanned farther than any human life were valuable beyond belief in my child's mind, something with a story that could be legend for all the lack of proof, except for this object. These old objects we rifled through at the flea markets held different degrees of connectedness. It was our pastime to work together on developing that eye to see and discuss their placement within the framework of time. Years ago, less than a year after my father died, only about 3 months new into my marriage and having just arrived to the city of Lyon, I was standing in front of a church built on original early Christian temple foundations that dated back to the Roman era. That warm afternoon, a buried passion for the lifelong project I had shared with my newly lost father was staring me in the face. This passion we had shared, and this place, one he never had the chance to see, this ancient place, took me and held fast, cemented me, shook the foundations of my grief almost violently. With that, like any slap to the face, I felt hurled back into a pre-loss-of-my-father frame of mind. That moment, my connection with Lyon the place grew. Not just a flash or a feeling. I believe Lyon has great value not only because it is old, but because it is thriving and old, and sprite and lanky, mean. But most of all, determined to survive and remain its very old self. I was standing in the "laboratory" of the Boulangerie that will become my teaching kitchen on my first visit and the floors caught my interest. They're a hodgepodge of various dated working class tiles, patched together. The shard like mosaic type floor is typical from about 80 years ago. There are plenty of things we could do with the floors, lay down hardwood, etc. There are bare areas as well, tamped bare earth where the oven has always been, for example. My plan is to find materials that harmonize with this rather random splash of tiling styles and hopefully to find a way to bring them all together, in my father's way. Uncovering and buffing out the little details, to hold in hand a bit of the existing patina, and pull out as much of this place's original story as I can. I just discovered your blog a few days ago and I love it. This past November my husband and I went to Paris for the first time in our lives and I fell in love. My husband eventually came around. I've heard wonderful things about Lyon and I hope to visit one day. In the meantime I'll experience it vicariously through you. Always inspiring! Thanks for sharing! Lucy, this last entry was so touching. I loved reading it, and through it, understanding what you are doing in your new home. Thank you for this personal and yet universal narrative. I love all your crazy floors..especially the long hallway. So genteel. I agree there is something magical about living in an old town. My theory is that the inhabitants have a better sense of the fleetingness of life. The walls were here before me and will be here after I'm gone. I'm loving following your renovation! I know that feeling, Lucy, that fondness and excitement for old objects. My prized posession is a handmade dress with slip and coat belonging to my great-great grandmother. It is beautiful and fits me perfectly. I am instantly transported and feel this great connection to this woman from another time. The floors in your new space are wonderful, especially the one with the swirled pattern. What a great starting point. You must be so enjoying just walking through your new space and feeling all of that past and the new possibilities wash over you. How thrilling! Please keep us in the loop, it will be so much fun to watch the progress. The floors you pictured are magnificent. Please share your thoughts on the transitional/harmonizing materials you are considering when the time comes. The human history in some of these objects and pieces is fascinating. I have a friend who routinely purchases hand made projects that look like they were made by a child in a shop class at school, and also those clay handprints that children often make early in school. We wonder what happened that family treasures and momentos have found there way to a flea market. Thanks Brenda, Ruth, Joel, Judith, Wendy and H. I will certainly share the details as they become available. Isn't it a strange thing to collect, H. I think people often look for something they might have lost when they search at flea markets. a wonderful story....thank you for sharing you and your father's shared love of the old and valued. you are in the perfect place to find those wonderful combinations as you start your new venture. good luck. 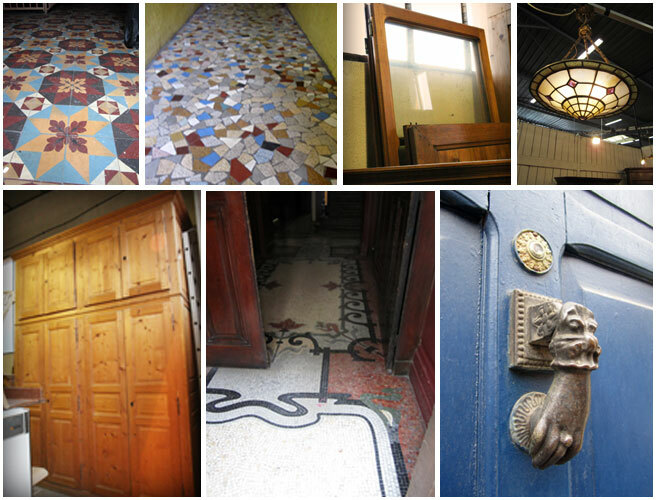 That lovely shade of blue on the door , the swirly Art Nouveau tiles on the floor .... beautiful ! And your memories of your father ... they match mine of my mother . That's a really lovely post and a lovely sentiment. Really enjoy your blog! Lucy - I realized over the past couple of days that it was the anniversary of your father's passing. I always feel like I've had s short visit to France when I read what Lucy has written...what a pleasure to read!